In my previous blog post, I had explained about how resistance can play out without acquiring any resistance factor or mutation in particular. I also mentioned that persistence can be achieved by simply shifting the cellular state to dormancy. Recently, an article published in Molecular cell by Cheverton et al; explored the mechanism of persistence in Salmonella typhimurium which makes an interesting case in point. Salmonella is a gram-negative bacteria of Enterobacteriaceae group. There are something like 3000 members of in Salmonella. 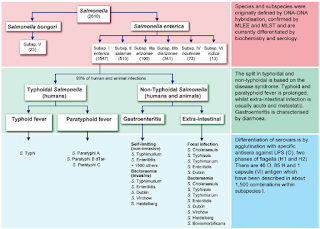 As per the previous classification, Salmonella had a single species Salmonella enterica and it was then typable into multiple subspecies. 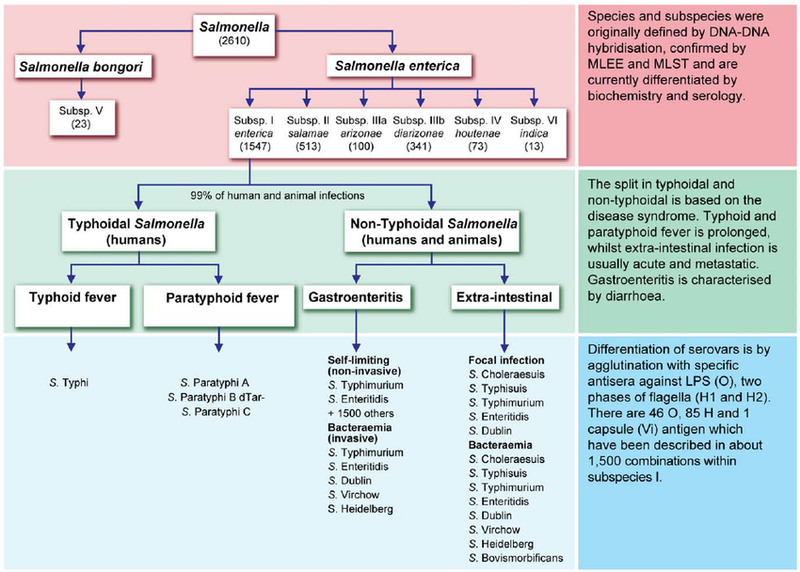 Subsequent DNA analysis showed that one of them Salmonella bongori is a different species and hence the current classification shows 2 species. See Fig 1, for classification details. Salmonella Typhimurium is not a species. Originally, it is Salmonella enterica subsp enterica serovar Typhimurium. In order to avoid the lengthy name, it is simply called S Typhimurium . It Infects humans, cattle, swine, sheep, horses, rodents and galliformes. The Toxin- Antitoxin system (TAT) is a bi-component system. The two components include a toxin that has a long half-life and an antitoxin with a short half-life. The point is the toxin will be produced by the bacteria and is lethal to itself until there is an antitoxin expressed somewhere in the genome to save itself. This provides a strong control over a variety of factors. Refer to my earlier blog post for details. TAT provides a mechanism of self-control. In the study, researchers showed that TacT is actually part of a TAT system and the protein is functionally related to GNAT (Gcn5 N-acetyltransferases) superfamily with known acetylation capabilities. They basically catalyse acetyl group transfer from acetyl-coenzyme A (Ac-CoA) to a wide range of substrates. Further cell free assays showed that TacT acetylates the amino acid of aminoacyl-tRNAs to inhibit translation, using acetyl-CoA as a cofactor. TacT acetylates the primary amine group of the amino acid on the charged tRNA molecules. Once acetylated, the amine group of the A-site amino acid would be unavailable to the carboxyl group and protein synthesis would be blocked. This merely leads to a prolonged lag phase a feature of being persistent. Most of the times, TAT involves a antitoxin mechanism to come out of locking effect. In this case, translation inhibition is not easy to overcome and hence researchers explored to see if they could turn out any Antitoxin independent mechanism. By screening for genes that suppress TacT toxicity the team hit upon peptidyl-tRNA hydrolase (Pth) as a possibility. Pth can deacetylate an already acetylated aminoacyl-tRNA thus reversing the effect. It is interesting to note that GNAT toxins are present in many pathogenic species such as Salmonella, Shigella, Vibrio etc. Typhimurium is notoriously known for its ability to persist inside macrophages and the same team had earlier reported that TacT is specifically activated upon entry of Salmonella in macrophages contributing to persister formation. This study provides a great model to look into how persistence can be achieved. It would be interesting to know what actually triggers the TacT. 1. Cheverton A, Gollan B, Przydacz M, Wong C, Mylona A, Hare S et al. 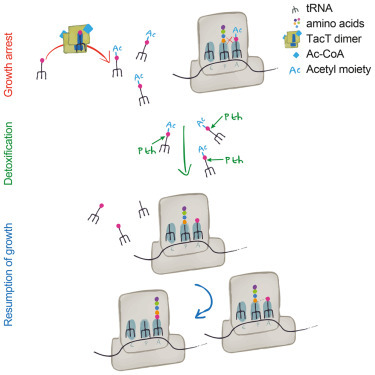 A Salmonella Toxin Promotes Persister Formation through Acetylation of tRNA. Molecular Cell. 2016;63(1):86-96. 2. Attar N. Bacterial toxins: An antidote to persistence. Nature Reviews Microbiology. 2016;14(8):473-473.